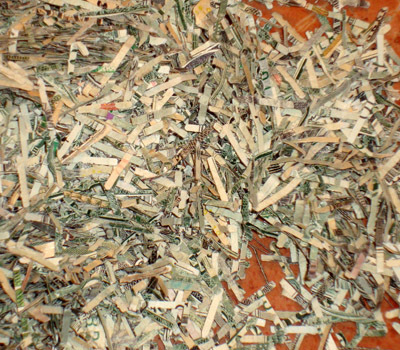 The Federal Reserve Bank of Atlanta destroys up to $10 million dollars a day. It also is home to a free Visitors Center & Monetary Museum with dozens of interactive exhibits, including the opportunity to lay eyes, not hands, on millions of dollars. The "Atlanta Fed" is one of 12 regional Reserve Banks in the United States that, together with the Federal Reserve Board of Governors in Washington, D.C., comprise the Federal Reserve System. Atlanta is one of only a few cities that have touring opportunities of a Federal Reserve Bank. providing financial services to depository institutions. 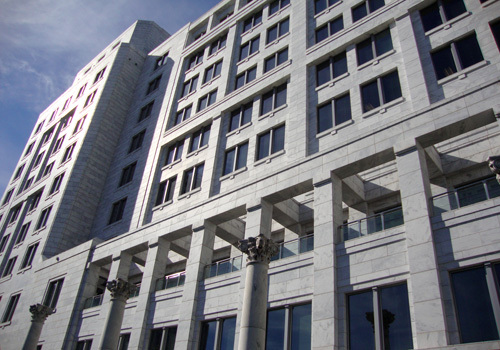 The seemingly formidable, pristine white marble vault on Peachtree and 10th Streets, the Federal Reserve Bank of Atlanta building, is the place to learn about these efforts…and visitors get to do it in a fun and entertaining way. I actually didn't know that there was a museum inside the Atlanta Fed building and never would have dreamed that admission is free. As it turns out, the museum is rather extensive, comprised of five sizable exhibit rooms. And at the end of your tour, you get free souvenirs! 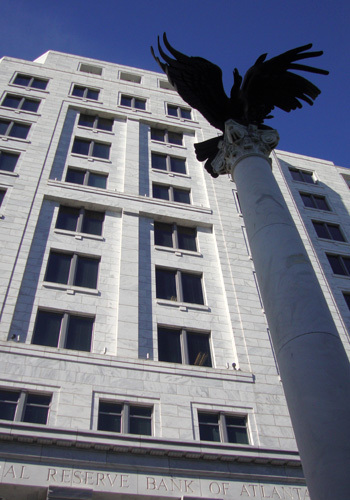 Immediately in front of the building's main entrance is a massive bronze eagle perched, wings spread wide, atop a column that was part of the original Atlanta Fed building that opened in 1918. The eagle sculpture was created in 1964 by Elbert Weinberg. Inside the front door is an almost majestic lobby, clad with same white marble that graces the exterior of the building. After going through a security check point, metal detector included, I approached a desk manned by a lady officer of the Bank's law enforcement unit. That's where I learned everything I needed to know about touring the museum. The Museum Room has nearly a dozen themed exhibits, including the Ring Cases: Money Over Time, that tells the tale of "money as a medium of exchange." Rare, antique and contemporary artifacts show the history of money, but don't get too close to the glass display cases…alarms will go off and this really is not a facility where you want to have security guards surround you. The other exhibits in the Museum Room (11 in total) are interactive...inviting you to touch, listen and learn. One, Myths and Realities, even has a huge neon display that illuminates the room with every right answer to questions relative to perceptions about the Fed. It does the same for every wrong answer, so be sure to study the preceeding stations. One of the ultra-cool exhibits, in the Cash Corridor room (five exhibits), is the display of large denomination notes, including $100 bills and the almost-never-seen $100,000 Gold Certificate. Would you rather have a bill with President William McKinley's depiction or one with the engraved likeness of Salmon Chase, who wasn't even a president? Believe me; you want to go with Chase. You'd have $10,000 in your pocket, although the McKinley $500 note is nothing to scoff at. 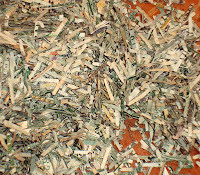 Next, it was on to the area where money is destroyed. I have to confess, while in the Cash Processing Viewing Area I recalled the movie "Mad Money," starring Diane Keaton, Queen Latifah and Katie Holmes, and wondered…but only for a millisecond. Alas, there are obvious security measures in place to prevent any "mishandling" of about-to-be-destroyed money (the gist of the movie). The robotic transports, vehicles capable of moving up to 2.5 million dollars at a time for processing, are basically nondescript, yellow, mechanical cages that you would probably never recognize out of context. It was also kind of cool to see how "routine" the handlers were performing their jobs, processing millions and millions of dollars. I might be tempted to incessantly daydream being surrounded by that much cash…cash that I couldn't spend. The Supervision and Regulation and Pocket Theater room continues the educational process of the role of the Federal Reserve Bank in the U.S. economy, which includes two short films. Touring the Federal Reserve Bank of Atlanta is a great diversion from one's everyday routine and quite an enlightening adventure, one I recommend including on the vacation must-see list. It will not disappoint…if anything, it sets the mind to dreaming all the while providing an inside look at monetary policy and money handling. The Atlanta Fed unfortunately does not allow cameras in the building, for obvious reasons. Just in case you bring yours with you, they kindly offer lockers, with keys, also free of charge. I do in fact recommend bringing your camera with you. The outside of the building is beautiful and one of only 12 regional Federal Reserve Banks in the world, not including their branches. One of the few museums I've ever toured that does not have a gift shop, the Atlanta Fed takes a completely different approach to providing souvenirs for visiting locals and tourists. 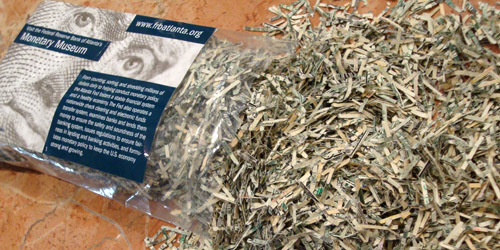 In addition to printed information about the Atlanta Fed, they provide free post cards and little bags of free money! Although the money is basically confetti at that point, I still think it's a cool memento of the tour. Do I think I will cash in on the opportunity for another free visit to the Federal Reserve Bank of Atlanta’s Visitors Center & Monetary Museum? It's pretty cool to see millions of dollars—to really see it—so I probably will return. Actually, I want to go back for the guided tour (also free) to learn more about the Atlanta Fed. Parking: Metered street parking and offsite parking garages are nearby. Hours: Monday-Friday 9 a.m. – 4 p.m. Closed for all legal holidays.